Cherokee Hills Park is the largest park in Warr Acres. It is nestled within the Cherokee Hills housing edition and is easily accessible. There are several play areas, picnic pavilions with grills, a large parking lot and 4 tennis courts. 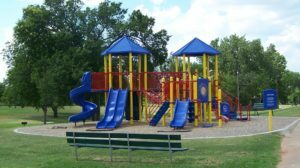 Playground equipment includes a colorful Playcraft system with slides, stairs and other activities for children. This facility has restrooms which can be accessed with prior arrangements through city hall for the keys. A partial basketball court, walking path and large grassy area provide lots of space for your large event.